Saftey Pilot Kit for natural gas aplications for log sets with 1/2in external threads on the end of the burner tube. Can mount straight out from burner pan or has fittings to allow valve to come forward, up from the floor and away from the burner pan. Uses White Rodgers High Capacity 250degree valve. 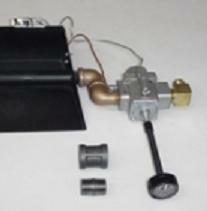 Kit includes fittings, pilot assembly, insulated heat sheild and instructions.